Everyone loves a good barbecue and the Town of Taber will be celebrating spring with its first-ever Backyard BBQ Competition, which is open to Vauxhallites and other regional competitors. Stakes (Steaks?) will be high as individuals/teams from emergency services and the public alike vie for the Best Overall Trophy of who is the grill master of their chosen meat. The Town of Taber, Taber Police Service and Taber Fire Department have joined forces to put on the event by forming an organizing committee. The idea of the competition began marinating approximately two years ago when Chef B was in Taber. Watch a movie about policemen and firemen and you will likely see a scene where the squad is enjoying camaraderie in the backyard over a barbecue. That same camaraderie wanted to be captured with the contest that gets emergency services and the public involved. 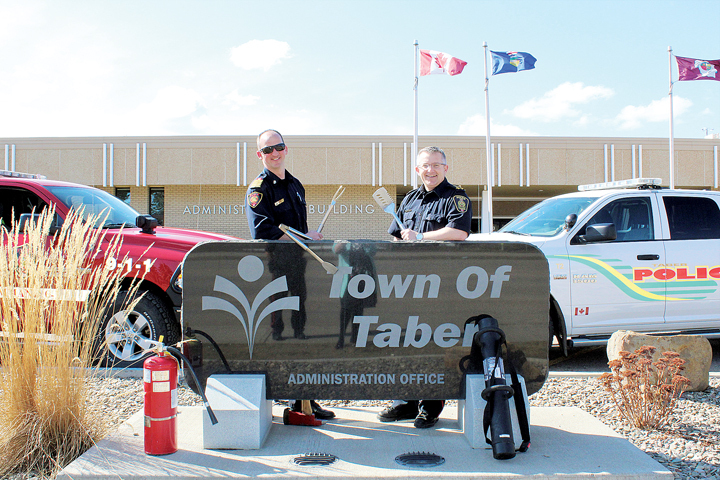 Friendly is a relative term as smack talk has already begun between the Taber Fire Department and the Taber Police Service, even though the competition is not scheduled until late May. There will be a maximum of 30 slots available for the Backyard BBQ Competition as either individuals or teams at the event which goes May 25 at Confederation Park. Organizers are encouraging businesses to register for the event to help build team camaraderie that has already seen excellent sponsorship rolling in. “We really want to make sure you have something to present for the judging event, but you also want to showcase what you can make with your smoker as you present to people who are walking around the grounds. Sort of showing to your fellow competitors that this is what I can make,” said Munshaw. The first ever Backyard BBQ Competition in Taber will be aided by a template that Dawn Phillips, director of recreation for the town, has been able to observe with her husband’s extensive experience in competing in Kansas City, Mo. competitions, the home of good BBQ. “We wanted to keep it very casual and fun. There are a lot of sanctioned events out there and we discussed that, but we decided we wanted something more fun,” said Phillips. The First Annual Backyard BBQ Competition goes from 8 a.m.-5 p.m. on May 25 at Confederation Park. At 5 p.m., a pulled pork dinner will be served for $5 each, with all the proceeds donated to the Taber STARS Charity Auction. The licensed event will be serving alcohol from 4-10 p.m. which will also feature kid’s activities and live music. There will be prizes given out for first to third place in both Emergency Services and General Public categories, along with one Best Overall Trophy. To register for the First Annual Backyard BBQ Competition, call 403-223-5544 (Ext. 3). There is a $100 entry fee. All teams must bring their own barbecue (wood, pellet, charcoal or electric only — propane barbecues not permitted). More details and rules can be found at http://www.taber.ca/Home/Components/News/News/82/16.